Hen Parties are a great reason to celebrate with friends. Whether it is really a last night of freedom doesn’t really matter. The main aim is to party and have a great evening. Of course it might not be just an evening. Nowadays, hen parties can expand to be a whole day, a weekend or even a mini-break , often taken abroad. Whatever you are planning then we would love you to celebrate it wearing one of our personalised hen party badges, rosettes or sashes. We have a great range of designs and are happy to customise the badges to fit with any theme for the night. Rosettes and Sashes can be made with a ribbon that will also complement any theme that you have decided upon for the party. We have supplied our products to thousands of hen parties since we started our business almost 20 years ago, and during this time we know that things are almost always left till the last minute. But don’t worry, we have a rapid turn-around on orders and can get the order to you quickly. Choose from our extensive selection of designs and add your own text , change the colours or suggest your own design. 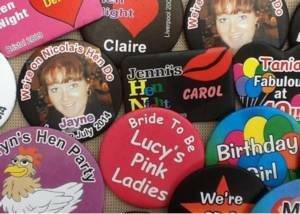 Hen night badges are available in different sizes to suit your kind of party. Any of the designs that are shbown foir the hen night rosettes, can be made into rosettes, Just choose the colour of ribbon that is required, and the number of ribbon layers. Hen Night Sashes are proving to be one of the most popular hen party sash additions. Our standard size for the sashes is 180cm x 4cm, which is approximately 6 feet x 4 inches. You can have whatever text you want on the sash. But please note that the area for the text, whether it is on the front of the sash or on the back is about 50cm x about 9cm. Otherwise if the text is outside this area then it might not be visible. The space however is large enough for most messages. So for the most impact we recommend that if there is a lot of text for the hen night sash, that we place this on 2 lines, that we put the top one in large text – e.g. Sarah’s Hen Night. Then make the second line with smaller text and use this for the date or some other secondary message. Buy hen party sashes at Custom Party Wear and get quick delivery.